Microsoft is just one of our clients to benefit from the Microsoft Most Valued Professional program and the Excel and Access MVPs on our staff over the past few decades. What exactly is a Microsoft MVP and how can the accomplished Microsoft solution experts on Excel Consultant’s team can help you optimize your operations? Below we will give you a good overview of the Microsoft Most Valued Professional program and what working with one of the top Microsoft Excel or Access MVPs can mean to you and your organization. Read the Microsoft Case Study. No matter what kind of business you run, chances are, you do so with the help of Microsoft software. For example, as Microsoft notes, “80 percent of the Fortune 500 is on the Microsoft Cloud.” Enterprises of all sizes can benefit from at least one of the programs in the Microsoft Office Suite, and likely multiple applications, especially with Microsoft programs’ expanding capabilities. In all likelihood, your company depends on Microsoft to function. However, it’s also probably true that your business isn’t making the most of everything this software has to offer. These multifaceted applications are so versatile and valuable that most executives don’t realize their full potential. Fortunately, the Excel Consultant team is here to change all that. Our programmers, instructors, and consultants have made it our mission to help our clients enhance their operations with the power of Microsoft software. Our specialists have earned the prestigious title of “Microsoft MVPs” due to our exceptional expertise and unparalleled service. In the following blog, we explain how you can optimize your business performance with Microsoft MVPs. 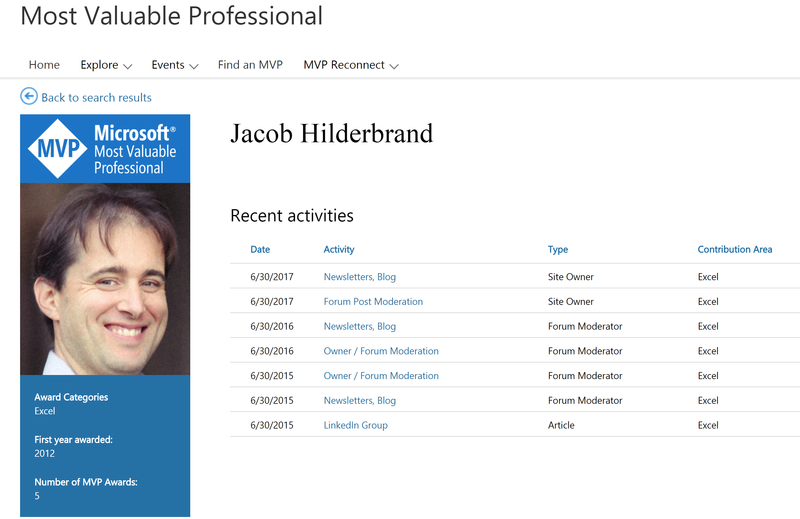 What Makes a Microsoft MVP? As is to be expected for such an esteemed designation, the selection process for Microsoft MVPs is very competitive. In fact, Microsoft notes: “of 100 million technical community participants worldwide, about 4,000 are MVPs.” That’s just 0.004 percent! To reward these MVPs for being in the top half a percent of all Microsoft software aficionados, the company provides them with distinct advantages: “key benefits to MVPs include early access to Microsoft products, direct communication channels with our product teams and an invitation to the Global MVP Summit, an exclusive annual event hosted in our global HQ in Redmond.” These special privileges empower Microsoft MVPs to become even more valuable players in their communities and to their clients. 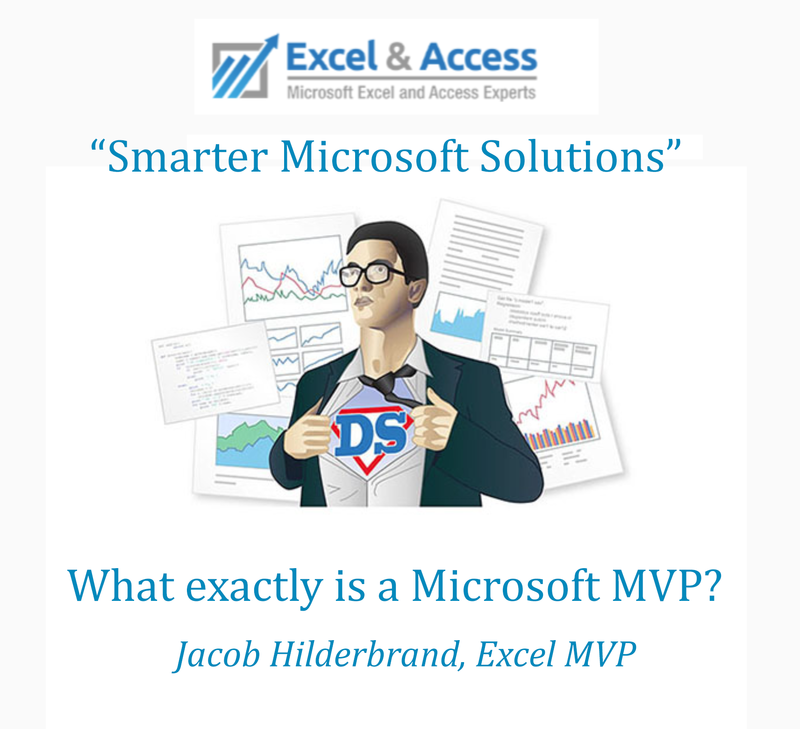 Excel Consultant is proud to employ a team of impressive Microsoft MVPs. For example, Jacob Hildebrand, our USA Lead Developer, has gone through the discriminating application process to achieve this honor not just once, but for three consecutive years! Jacob and the rest of our consultants utilize their outstanding qualifications and proven dedication to assist our clients. So, you understand what a Microsoft MVP is, but does your business really need to partner with one of these software virtuosos? Our answer, of course, is a resounding: “yes!” Even if you think your Microsoft programs are running smoothly, they’re almost certainly not offering everything they could for your enterprise. Consulting with you to determine which areas of your operations could be improved. With our Microsoft MVPs’ attention to detail and in-depth knowledge of this software, we can spot inefficiencies you might have never noticed. Streamlining and simplifying your spreadsheets. Excel is a powerhouse of a program, but it can easily become a tangled, time-consuming mess. Even if it’s technically doing what you need it do, a Microsoft MVP can program Excel to automate key administrative tasks. Speeding up your invoicing, payroll operations, inventory, and other functions could save your company time and money. Customizing your applications to operate exactly as you need them to. Microsoft programs are already very useful, but personalizing your software can help you accomplish your goals even more efficiently and effectively. Our Microsoft MVP development team can program a state-of-the-art solution just for your business. Teaching your team how to better run Microsoft programs. A major aspect of being a Microsoft MVP is contributing to the community of users with educational tools and guides. Excel Consultant’s Microsoft MVPs offer a variety of training services to help you and your team harness the true power of your software. These are just a few of the ways partnering with one of our Microsoft MVP could help your company excel. Consolidated and streamlined Honda’s finance databases in order to enhance their new BI (Business Intelligence) system. Improved the data analysis operations surrounding PepsiCo’s employee onboarding and certification process so they could better evaluate their progress. Since then, PepsiCo has collaborated with Excel Consultant’s Microsoft MVPs on numerous other projects, as well. Created a customized data aggregation and spreadsheet system in Excel for the major financial firm, Morgan Stanley. Programming a sales and distribution tracking tool for Red Bull to help the company better manage its hundreds of accounts. This was a complex computing conundrum that other technology consultancies had failed to solve, but the Excel Consultant Microsoft MVPs were up to the task. Designing and developing new Excel templates and BI tools for Microsoft itself. That’s right; our Microsoft MVPs are such valuable players that the company brought our team on to help optimize their own operations! The solutions Excel Consultant provided for these companies helped them all minimize waste and maximize profits. We are delighted to have helped them. Are You Ready to Optimize Your Business Performance? With a Microsoft MVP on your team, the sky is the limit! Excel Consultant can help your company leverage all the advantages of Microsoft software to boom your business. Contact us today to schedule a consultation. Posted on January 26, 2018 Posted in Blog Category and tagged Experts, Event, Technical, Spreadsheet, Business intelligence.